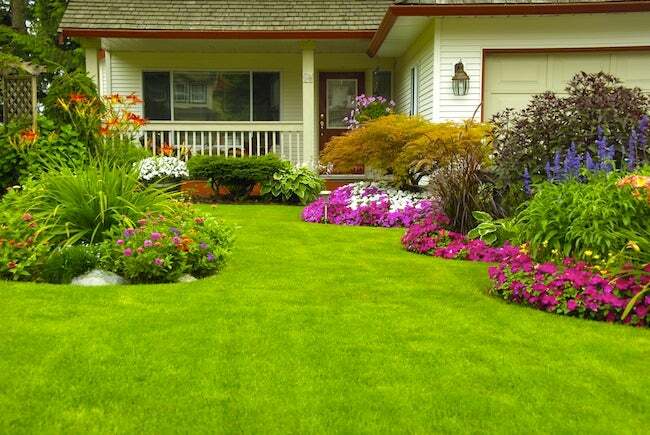 There is nothing more beautiful than a lush, green, manicured lawn. If you want yours to be the envy of the neighborhood, follow these lawn-care guidelines. Americans are not bashful when it comes to expressing their love of lawns—it has been estimated that there are more than 40 million acres of lawn in the United States. But if you really want to show your lawn some love, you’ll have to do more than mow it. If you’re starting from scratch, you’ll need to learn about your soil and climate, and then decide between sod, seed, or a lawn alternative. If you are working with an existing lawn, you’ll want to familiarize yourself with the proper way to water, fertilize, and eliminate (or better yet, prevent) unwanted weeds. If you count yourself among the lucky homeowners with land to spare for a verdant landscape, these guidelines should help you cultivate a beautiful lawn that will reward you year after year. Till the soil and remove weeds, rocks, and plants. Consider adding fresh topsoil mixed with an organic material to improve water retention, and a fertilizer to stimulate germination. For small areas you can sow the seed by hand; for larger areas use a seed spreader. Cover the seeded soil with straw to protect the seeds and help them retain moisture. Section off the area to avoid foot traffic. Water daily and do not mow the grass until it is at least three inches high. Water less frequently as the grass matures. Laying sod is a great way to have a lawn without the wait, but it’s a big job. Best done during the fall or spring in the North, or during spring in the South, lay sod during cooler weather so the grass can take root and avoid the risk of burnout. Familiarize yourself with this how to before deciding if sod is right for your lawn. Lawn alternatives provide as much greenery and coverage as a regular turf but can be lower maintenance, hardier, and even scent-filled. There are many varieties to consider—from micro clover to Corsican mint—so be sure to check to see which is best for your lawn, climate, and upkeep. Most lawns require about one inch of water per week. It’s better to give your grass a good soak every three days than to water a little bit every day. Your lawn will tell you when it needs watering, provided you know the signs. As you walk over the grass, your footsteps should readily disappear; if they don’t, you need to water. A bluish-green color and curling glass blades are also indicators of dehydration. Watering less frequently encourages roots to grow downward (in search of water), which makes your lawn more stable. In most climates, a deep, thorough watering twice a week should be enough to keep your lawn happy. Water your lawn in the early morning, so there will be less evaporation. Grass will also have a chance to dry out before the sun starts beating down. Grass requires small amounts of many nutrients (calcium, magnesium, and sulfur to name a few). Macronutrients like nitrogen, phosphorus, and potassium are needed in larger quantities. A soil test performed by your local extension office will reveal what your lawn needs to succeed. The results of the test will include a range of information, such as your soil’s pH. Cool-season grasses (including Kentucky bluegrass and tall fescue) benefit most from fertilizer in the fall, at which time the added nutrients go a long way toward bolstering root growth. For warm-season grasses (including zoysia and Bermuda), springtime fertilization is appropriate once the lawn is actively growing, about six weeks after the last frost date. Using slow-release fertilizer prevents nutrient overload and lowers the risk that your application will contribute to shoot, not root, growth. Never cut more than one-third of the blade; any more will shock the plant. During hot summer months, cut your lawn higher than the recommended rate. Switch mowing directions to prevent turf wear and soil compaction. Familiarize yourself with these common lawn-care problems, from dandelions and ants to brown patches. Learn to mitigate— or better yet, prevent— these pesky predicaments to keep your lawn healthy and lush all year long.